Haiti’s political crisis deepened on Tue., Dec. 9 as an 11-member presidential “advisory commission” proposed that Prime Minister Laurent Lamothe step down, a recommendation which will swell the ranks of thousands of demonstrators nationwide calling for President Michel Martelly’s resignation. The capital’s next major demonstration, planned for Dec. 12 when U.S. Secretary of State John Kerry visits Haiti, is expected to be massive. The advisory commission’s 10-page report also recommended the sacking of Martelly-pawn Anel Alexis Joseph, who heads the Supreme Court and the Superior Council of the Judiciary Power (CSPJ), the resignation of the Electoral Council, and the release of all political prisoners. “This is a rescue operation by the international community aimed at saving the mandate of President Martelly while Martelly is primarily responsible for the crisis,” said outspoken lawyer Andre Michel, a leader of the Patriotic Movement of the Democratic Opposition (MOPOD), the Miami Herald reported. In its eight days of existence, the advisory commission had some clashes. On Sun., Dec. 7, former Sen. Gabriel Fortuné, who was expelled from the anti-Martelly Dessalines Children platform for taking part in the commission, made headlines when he said that commission coordinator Reginald Boulos refused to allow investigation into the unaccounted funds of the National Education Fund (opaquely filled with and emptied of millions of dollars in illegal taxes of $1.50 on every international money transfer and 5 cents on every minute of Haiti’s overseas phone calls over the past three years) and the PetroCaribe account (which receives about 40% of the revenues from Haiti’s Venezuelan oil sales). Fortuné also said he would not sign the report unless all 10 prominent political prisoners were immediately released. To the surprise of many, all the commissioners signed the report on the evening of Mon., Dec. 8 at the Ritz Kinam Hotel in Pétionville following a meeting with Senate President Simon Desras Dieuseul and President Martelly. The commission then handed the report to Martelly in an official ceremony at the National Palace on Dec. 9. In the run-up to Kerry’s much-anticipated visit, U.S. Ambassador to Haiti Pamela White reiterated Washington’s support for Martelly. “We believe he was elected for a certain period of time,” she told Le Nouvelliste in an interview. “He must stay until his mandate ends” on May 14, 2016. But the tens of thousands expected to march on Dec. 12 disagree and are calling for Martelly’s immediate resignation, as they have in many demonstrations, each larger than the last, over the past two months. Lamothe is expected to run for President of Haiti at the end of 2015. 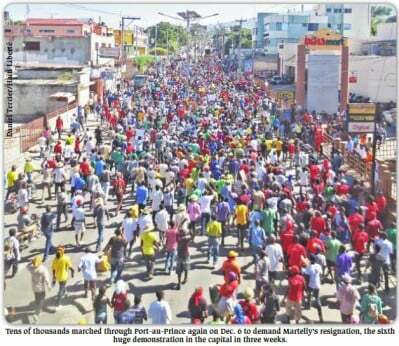 On Dec. 5 and 6, Port-au-Prince saw giant marches calling for both Martelly and Lamothe to step down. Demonstrators hurled epithets in front of the French and Canadian embassies, as they had on Nov. 29 in front of the U.S.’s, and held up pictures of Russian President Vladimir Putin as a way to express their rejection of U.S. and French imperialist meddling in Haiti. 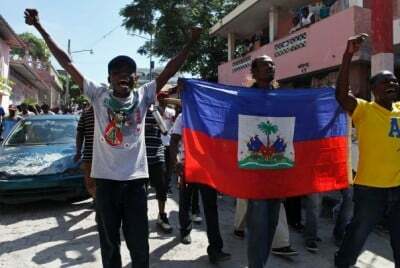 On Dec. 6, thousands also marched for Martelly’s resignation in Cap Haïtien, Haiti’s second largest city, and in the southern city of Aux Cayes, where protestors were also marking the 85th anniversary of the 1929 massacre by U.S. Marines of a dozen demonstrating Haitian peasants in Marche-à-Terre during the first U.S. military occupation of Haiti (1915-1924). From Dec. 3-5, 11 of Haiti’s remaining 20 senators, most of them pro-Martelly, held a desperate conclave at the fancy Club Indigo resort in Montrouis near St. Marc to “find a way to save state institutions” and to “avoid disruption, dislocation, and chaos.” Their final pathetic resolution called on President Martelly to “urgently convoke all the major powers of the State to take all necessary measures to safeguard the Nation-State of Haiti,” and all that before Christmas. Needless to say, the six senators who have opposed Martelly’s efforts to ram through a rigged electoral law and electoral council did not sign the final document. Martelly plans to begin ruling by decree on Jan. 12, 2015 if no agreement is reached and Parliament is allowed to expire. But demonstrators want Martelly to step down and to have a provisional government set up a new electoral council that will hold elections now delayed for over three years. It is a high-stakes game of chicken into the middle of which Kerry will be stepping.